Cosmeston Medieval Village is a "living history" medieval village near Lavernock in the Vale of Glamorgan not far from Penarth and Cardiff in south Wales. 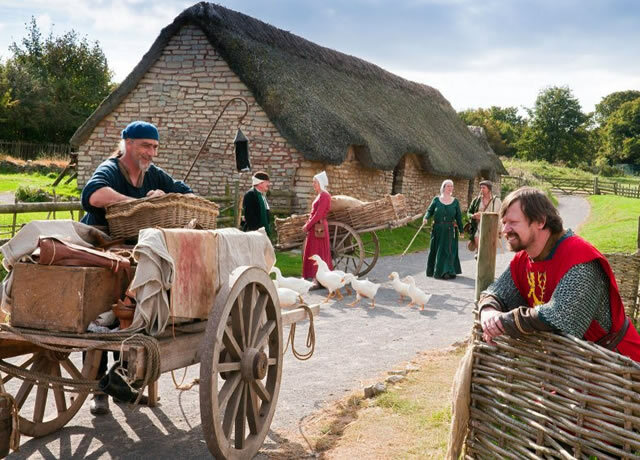 Based upon remains discovered during a 1980s archaeological dig in the grounds of Cosmeston Lakes Country Park, it is a re-creation of 14th century peasant life in Wales in the Late Middle Ages. The original Cosmeston village grew around a fortified manor house constructed sometime around the 12th century by the De Costentin family, who were among the first Norman invaders of Wales in the early 12th century following William the Conqueror's invasion of neighbouring England in 1066. It is unlikely that the manor house at the site was a substantial building and there is documentary evidence that by 1437 the manor house had already fallen into total ruin. Its precise site has just been located. The village would have consisted of a number of small stone round houses, or crofts, with thatched roofs, as depicted in the current reconstruction, and the village population would have been between 50 and 100 people at most, including children. The de Costentin family originated on the Cotentin peninsula in northern France. They were the first lords of the manor and they called the village Costentinstune, which over time became known as Cosmeston. They built the original manor house and, perhaps, a few dwellings or small farms, but for the next two centuries it appears that little further development occurred. Around 1316 the manor passed into the hands of the de Caversham family, also of Norman descent. The buildings that have been excavated so far seem to be from the 14th century. It would appear that the de Caversham family brought a more designed approach to the development of the community and a better regulated and more compact settlement began to develop during their stewardship of the village. There is little sign that the village continued to develop much past the later middle ages. Unusually, no Norman church was ever established in the immediate area, so by 1824 all that remained of Cosmeston village were four isolated crofts and the Little Cosmeston Farmhouse as shown on the Marquis of Bute's detailed maps of the time. It is quite possible that the majority of the villagers were wiped out during the Black Death plague of the 1340s or the later outbreaks, leaving Cosmeston a Deserted medieval village. In addition to the plague, the villagers would have had to combat other difficulties. The land is low-lying and at the mercy of the many water sources that now feed the Cosmeston Lake. There is substantial evidence of drainage dykes, but even they would have struggled to keep the arable land free from waterlogging and constant flooding. Additionally the period was one of permanent political upheaval with intermittent resistance and armed conflict between several local Welsh leaders. In January 1316, for instance, Llywelyn Bren attacked Caerphilly Castle, and for the next two months there was conflict and devastation throughout the Glamorgan region. By the 20th century all evidence of the village had vanished and local residents had no idea of its previous existence. When the Snocem Concrete works and the Cosmeston limestone quarry closed in 1970, the land was developed under Countryside Commission funding as a country park. During the landscaping of the new country park the first evidence of the medieval village was unearthed and an archeological exploration was undertaken. The resulting heritage reconstruction has been described as the best representation of a medieval village currently available in Britain. The Reeve's Buildings. The farm of Walter the village reeve is a series of buildings rented from the lord of the manor; a cottage, barn and byre all constructed around an open courtyard and with adjacent gardens. Although it cannot be certain that this is the reeve's home, the property is of such a standard that a villager of high status would have lived there. The main role of the village reeve would have been to ensure that the village agriculture was running smoothly and that the peasants were looking after their crops and not encroaching onto their neighbours' property. Jake’s Cottage. This simple, rectangular style of building would have housed a less well-off peasant member of the community. There were two types, 'customary' tenants or 'free' villagers, who were eligible to sit on a jury in the manor courts and fill official positions such as reeve or bailiff. The 'villein' tenants were 'unfree' villagers who were tied to the land and bound to the village. These tenants would have lived under many restrictions, unable to leave the manor or get married without the lord's permission and having their ability to look after their own crops severely curtailed by having to work on the lord of the manor's fields. The Baker's House and Village Ovens. The village baker was a man of substance who rented a building in which he produced his goods in ovens and sold his baked goods. Only the baker, having paid the lord of the manor rental for the ovens, was allowed to bake bread. This did not make him popular with the rest of the villagers. Next to the baker's cottage is a small building constructed around two ovens. One is for baking bread and the other is a malting oven for roasting barley to make ale, as the bakers cottage is also the village tavern. The Tithe Barn. The village tithe barn is where taxes were recorded and stored by the village priest before being moved on for sale or distribution to various clergy. Of all the medieval taxes, the tithe had an impact on most. Everything that was grown, produced or made was subject to a 10 per cent tax by the church. The Swineherd Cottage. In a village environment, the swineherd could find themselves responsible for most of the village pigs as they foraged through the surrounding woodland. The nature of the swineherd's work is reflected inside his house, which is a combination of home, pig yard and butcher's. Outside is a small run and pigsty for when the pigs are brought in from the woods. The Herbalists Hovel and Herb Garden. During the original excavations the archaeological team discovered the ‘shadow’ of a structure located near the North end of the village. This feature has always been known as building ‘J’. Nobody has ever known much about its use or reason for being. This has led to staff onsite deciding to construct a ‘wattle and daub’ structure to recreate a possible example of the building and its use. Today it is open as the ‘herbalist hovel’ . This is an area where a wise woman or apothecary may rest and store herbs as she works the herb gardens under the watchful eye of the village Reeve. 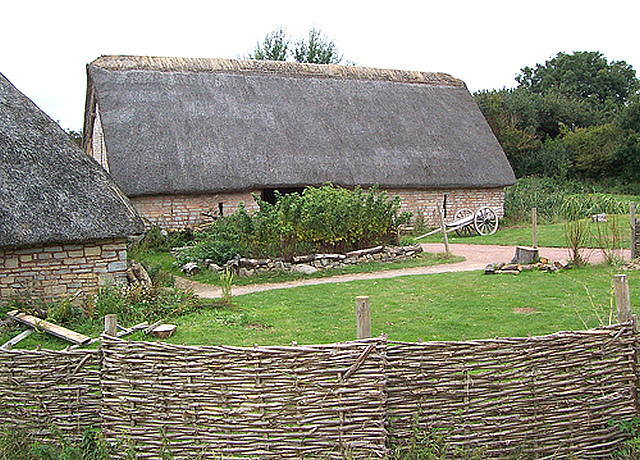 The reconstructed element of the medieval village represents only a small part of what would once have been the manor of Cosmeston. An important part of the project is understanding the context of the village in relation to the surrounding landscape. This would have consisted of farmsteads, wetland and coastal fishing sites, pastoral and arable farming, woodland and of course, the manor house with its associated farmland, gardens, orchards, fishponds and dovecote. Click here for a map of the Medieval Village. Entry to the medieval village is free of charge from 10am until 12 mid-day and no booking is required. (A charge will only apply during an event being held at the medieval village). You are invited to wander round the furnished buildings and grounds at your leisure not forgetting to visit the museum in the small white cottage. Once inside the museum you will find many artefacts on show and have the opportunity to view information boards displayed upon the walls that provide additional information. Costumed guided tours are offered daily. The guide in costume and character will lead you as 'the visitor' to their village on an entertaining tour of the furnished buildings and grounds. You will also have the opportunity to interact and ask the villager questions. Upon your visit you may encounter; Henry Hogg the swine herd, Elsbeth of Oxford, Father Edwin the village priest and Walter the village Reeve. The site is wheelchair accessible with firm, level surfaces. Assistance dogs are welcome. Wheelchair accessible toilets (These are located at the visitor information centre), with grab rails and easy access to wash basin. Wheelchair turning space in accessible toilet. Room for carer/carers in the accessible toilet. Why not enhance your visit and hire an audio wand. The wands provide a voice who, in character will inform the visitor about the village. The audio wands can be set to provide this entertaining tour in English, Welsh, French, and German. Audio wands can be collected from the main Visitor Centre. Transport : Penarth (National Rail) then bus (94, S51). Bus Routes : 88, 91, 94, 94B and X51 stop close by.